With the HBA cable laying mostly done at Chilbolton, work has intensified on the LBA. This means getting all the recently dug trenches re-surveyed ready for the deployment of the cables. 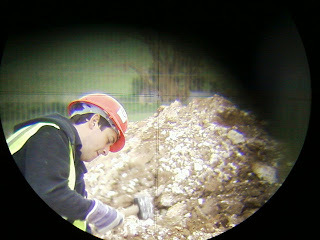 The process for doing this involves the surveyor using the theodolite to find the location of the cable exit point. 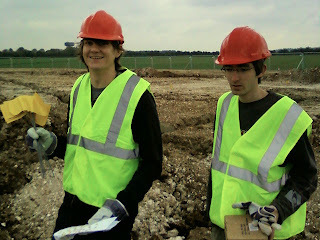 Once the exact position has been determined, the survey staff is removed and a marker peg hammered into the ground. This photograph was taken through the theodolite. Moments earlier, the top of the survey staff was at the cross-hair. Having established the position, the staff has been removed and Jack Hickish pounds a steel survey peg into the ground to mark off the position. Danny Price and Remi Paulin return from a morning of survey work.